Dylan had wanted, really wanted, this job. His first, aside from mowing lawns and stuff. He had been really happy when he got it. He was still kind of happy about it. He did need to make some money. He knew there were plenty of worse jobs. He remembered that story about a pottery maker’s apprentice, in China or Korea or someplace like that, who spent years doing the most menial, repetitive tasks before he was allowed to even handle the clay. There was another one about a kitemaker’s apprentice. So this could be that part of having a job. What awesome and noble skill it could lead to remained a mystery. Dylan had only been hauling and unloading boxes of groceries for three weeks and it already felt like a lifetime. He was only a little ways into today’s shift, and the remaining hours stretched before him, an endless desert. With a little lunch oasis. The lame music oozing out of the speakers was slowly turning him into an automaton. He didn’t realize he had come to a complete standstill until an older lady pushed her cart into his aisle. Not knowing how long he had been standing there, he turned and busied himself with the closest thing to hand. 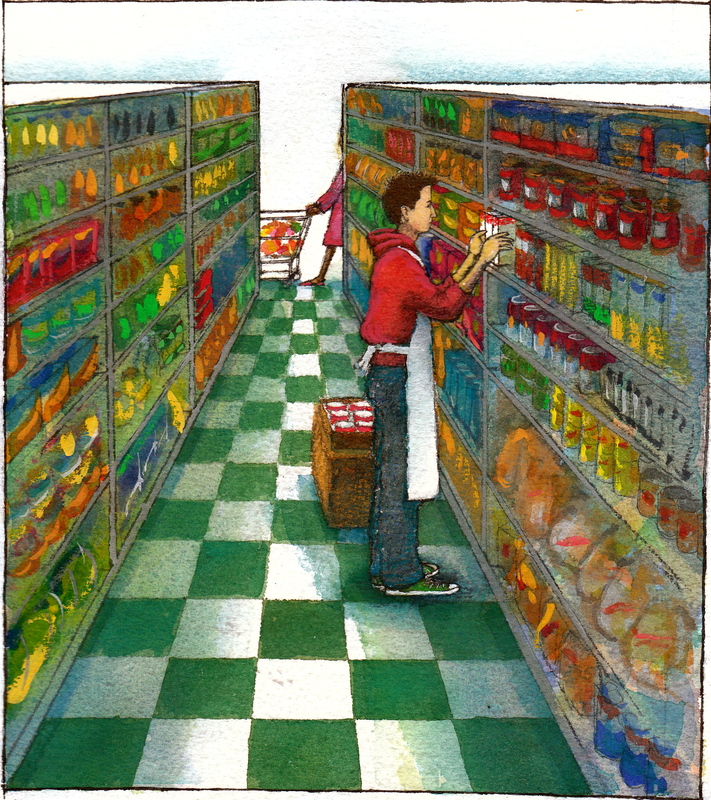 He diligently moved the Uncle Ben’s Rice boxes forward and backward by fractions of inches so they all lined up. Focusing intently, as if it mattered. He became the shelf-stocker’s apprentice, displaying his craft. “It’s right there,” said Dylan, pointing, in another impressive show of expertise. She took a couple of cans, put them in her cart and moved on. He looked down at his sneakers to remind himself that he had a life. Then he started in on the soup shelf. I walked to the Post Office with our old dog Lucky yesterday. We were nearly there when I saw, in the alley ahead of us, a cactus in a metal half-barrel on wheels. There was another tub on wheels, too, with another kind of plant, a lavender. But this is northern Michigan. We have lavender. The cactus was the intriguing one. It was not one of those tiny ones you get in a souvenir shop. It was sizeable. The two tubs were just outside the open doors of a big garage. We stopped to look, and their owner came out of the garage. “Do you like my cactus?” he asked. He told us it was a “something-something cactus.” (Actually, he said “Nopales.” I didn’t quite catch it at the time, but I looked it up later.) He said it was the kind of cactus they make cactus tacos out of. “I didn’t know they made cactus tacos!” I said. He said they also make CACTUS SMOOTHIES. Is that an oxymoron, or a paradox, or what?! 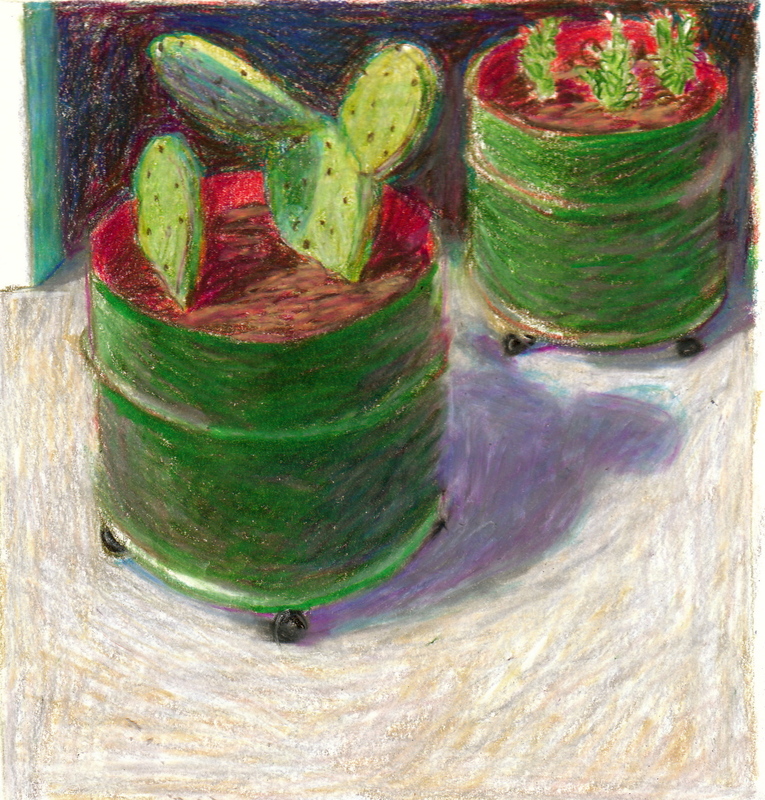 The name of the proprietor of the cactus on wheels is “Nick.” He is planning on opening a bike shop in the garage. He seems like a nice guy. The first has just the cactus and the lavender in their tubs. The second has Lucky in the foreground, looking at the cactus with interest. When you put something, a figure or an object, in the foreground of a picture this way, it is called “repoussoir.” It’s from a French word that means “to push;” putting this thing in the foreground pushes back the rest of the picture and makes us experience the space in a different way. If it is a person (or a dog), it also can create a little bit of a story. And if we follow the line of sight of the dog, which we do without realizing it, that leads us into the heart of the action. 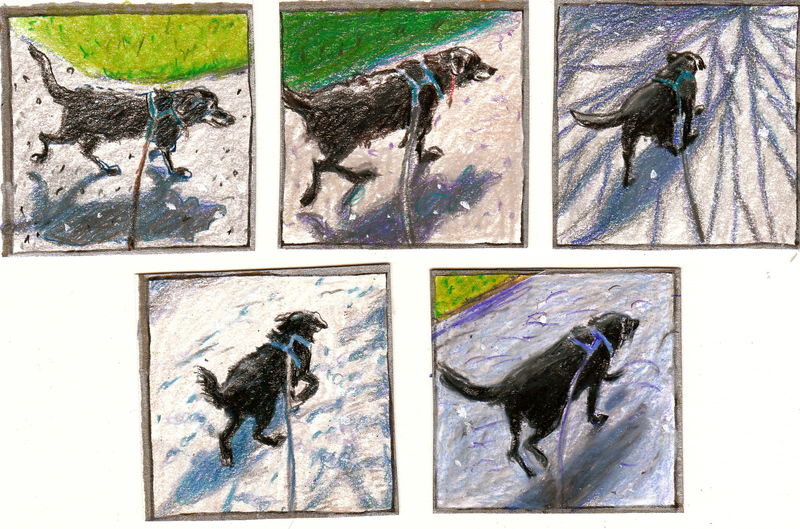 Aside from French words about the composition of pictures, my husband, Bill, says, “Pictures are always more interesting if there is a person (or a dog) in them.” What do you think? 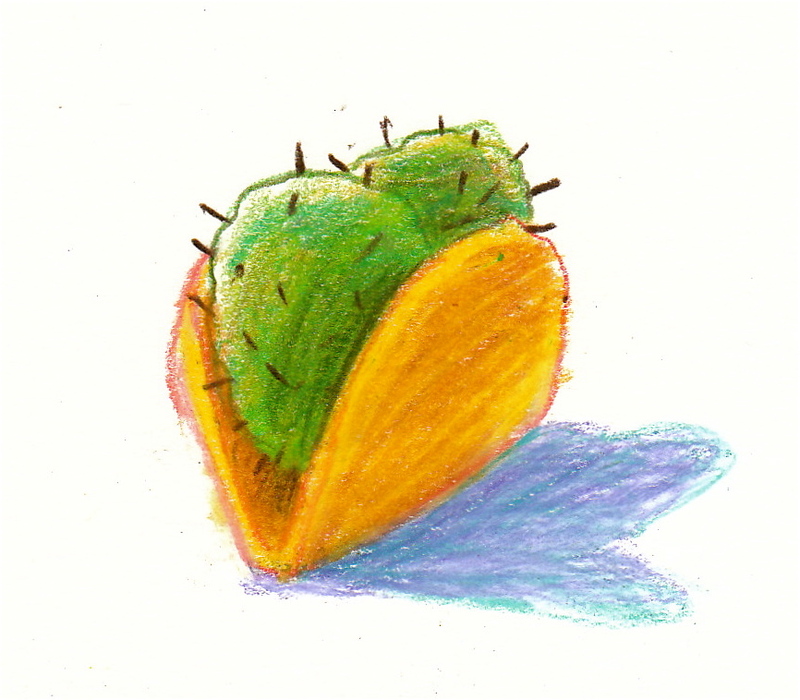 And one more picture: I don’t think this is what cactus tacos really look like. But it’s the picture that popped into my mind when Nick said it.